"Judith can&apos;t speak. But when her close-knit community of Roswell Station is attacked by enemies, Judith is forced to choose: continue to live in silence, or recover her voice"--Provided by publisher. 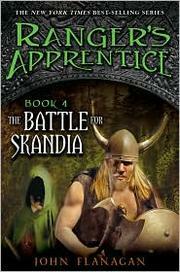 After Ranger&apos;s apprentice Will battles Temujai warriors to rescue Evanlyn, Will&apos;s kingdom of Skandia joins forces with rival kingdom Araluen to defeat a common enemy. "Snail, a midwife&apos;s apprentice in the Unseelie Court, meets Prince Aspen, a Seelie prince being held as a hostage in order to prevent a war. In thinking that they are stopping the war, they instead trigger one"-- Provided by publisher. "Recon Team Angel must stop the alien invasion across the frozen Bering Strait into the Americas--the last free human territory remaining--or all will be lost"-- Provided by publisher. Two Union soldiers, one too young to have properly enlisted, and the other a girl disguised as a boy, find themselves struggling through the rigors and horrors of war, from amputation to the Andersonville prison camp. An English boy during World War I comes to believe that the battles he enacts with his toy soldiers control the war his father is fighting on the front. This compelling and thought-provoking fantasy set in the world of The Two Princesses of Bamarre, introduces a spirited heroine who must overcome deeply rooted prejudice---including her own---to repair her broken country. A grandmother tells her story of being tricked into exchanging her young body with that of a fox and trying to get it back while a war tore apart her home and her country. In 1746, a year after the Scottish clans have rallied to the call of their exiled prince, Charles Stuart, to take up arms against England&apos;s tyranny, fourteen-year-old, epileptic Duncan MacDonald and his cousin, Ewan, run away to join the fight at Culloden and discover the harsh reality of war. An abridged version of the tale set in the spring of 1863 when, while engaged in the fierce battle of Chancellorsville in Virginia, a young Union soldier matures to manhood and finds peace of mind as he comes to grips with his conflicting emotions about war. Recounts the struggles and hardships faced by Jeff Bussey on his 300-mile escape route during the Civil War.